In January 1964 there were cosultations between the US and the Saudi governments regarding the possible purchase of a new fighter to arm two/three Squadrons. The US preferred to offer the Northrop F-5A Freedom Fighter over the Lockheed F-104G or F-104H to limit the use of the aircrafts in short range, air-defence and light ground-attack duties. Northrop F-5B demonstrator serial 63-08442 was evaluated in June 1964 at Wiesbaden, in August 1964 at Dhahran. Contemporanously British Aircraft Corporation conducted demonstration flights in Riyadh of the much more powerful, but highly complex, Lightning and on 22 December 1965 Saudi Arabia announced an order to supply for 34 BAC Lightning F. 53 and 6 Lightning T.55, putting an end to US hopes. An new, ambitous, programm to develop the Air Force was established in the early '70s, when a less sophisticated aircraft, mainly for ground attack and as secondary air interception duties, was looked for to train local personnel and to reduce the heavy dependance on foreign military support and of contractor technicians. The Saudi aim was to achieve maximum self-sufficiency in all facets of F-5 operations, training and support, but to leave room for augmentation by outside help. The Northrop F-5, modified in an pecular to the country form, was selected, purchase went through US Foreign Military Sales channel. The technical operation was integrated into the US Air Force spares system so that parts and even complete refurbished aircraft would be obtained direct from the USA. A large, double than required by NATO, stock of spare parts was bought and stored at airbases and dispersal airfields. At the same, in 1973 McDonnell F-4 were requested but the offer from the USA government placed unacceptable restrictions, as it preferred to build bases with large hardened aircraft shelters near to its main port/holy cities (Jeddah/Medina) and sensitive borders (Yemen and Israel/Jordan/Iraq) in order to make good for the short range of Northrop F-5s. Introduction of the Tiger was accomplished in six phases, called Peace Hawk I to Peace VI and lasted from 1971 till 1986; 1'000 air-to-air missile AIM-9J, and in a second phase 600 AIM-9P-3, were also bought. In flight refuelling tankers were needed for the rapid deployment to the very distant bases; four, later increased to eight, Lockheed KC-130H were received in 1975, first being part of No 4 and No 16 Squadron, later to equip No 32 Squadron at Al Kharj AB (one has been lost on 16-02-85). 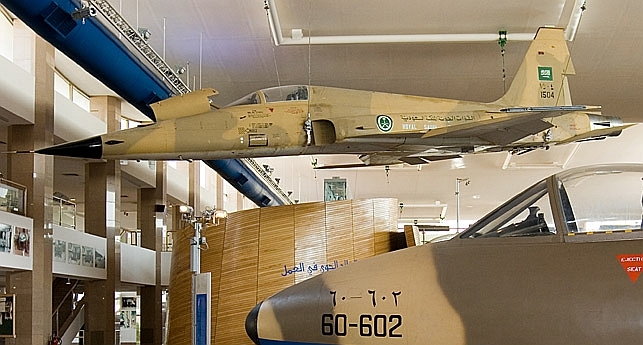 A Letter of Offer and Acceptance for 20 Northrop F-5B two-seat trainers was signed on 28-06-71 for USD 42.3m by the Saudi Arabian Minister of Defense and Aviation, and included USD 25.2m for the aircrafts, the remainder for check-out equipment, spares, mobile training units and various other support equipment. In-flight delivery (via the Atlantic in USAF markings) of the first two Northrop F-5B was on 07-09-72, followed by two on 10-10-72, to be completed 05-02-73 when the last six were delivered. Northrop F-5B 01352 in USAF delivery markings departing Prestwick on 05-02-73 under an winter sky. Photo: The Northrop F-5 Enthusiast collection. The second Letter of Offer and Acceptance, this time for 30 Northrop F-5E and support equipment was signed on 29 September 1971 for the value of USD 106.7m; the aircrafts cost was USD 56.8m the remaining amount was utilized for the purchase of support equipment, spares, contractor technical support, and aircraft delivery. These aircraft, and the Northrop F-5B, had some special features: aerial refueling capability (not on F-5B), assisted take off system (JATO), LN-33 inertial navigation system, reconnaissance nose with a KS-121A camera, ARN-58 instrument landing system. These features increased the total cost to USD 128.4m. As a result of these changes, first deliveries could only take place in January 1974 instead of December 1973, as planned. Normal delivery schedule which was completed anyhow in late 1974. 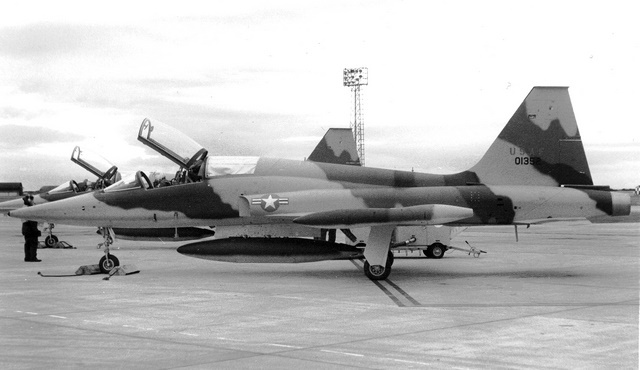 Northrop F-5E 00915 (Peace Hawk II) awaiting delivery at McClellan AFB in 1974. On 04-02-72 a contract was signed with the USAF to establish with Northrop Aircraft Division (NAD), on behalf of Saudi Arabia. Primary objective was to assist the RSAF in achieving maximum self-sufficiency in the operation and support of their aircrafts. Northrop was to train pilot and technical training for assigned RSAF personnel, construct and modify required facilities at Dhahran and Taif Air Bases, conduct English language courses, required maintenance and supply support while training RSAF personnel to assume these duties. 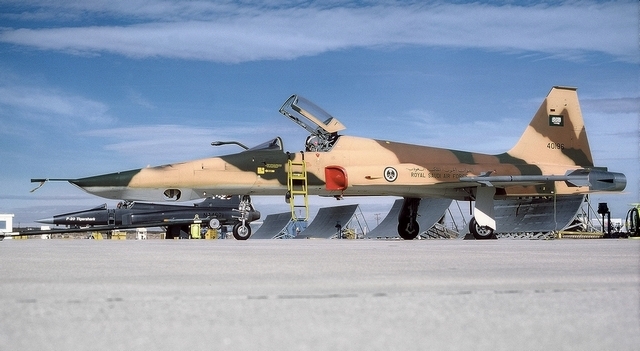 Negotiations for the fourth phase started in October 1973 with a the Saudi price request for 50 Northrop F-5E. This was modified for during summer 1974 to 40 Northrop F-5E and 20 F-5F; purchase negotiations were only completed on 04 January 1975 due to the crise of the Arab oil embargo on the USA; delivery was to be between 1977 and 1980, price approximately USD 769m. These aircrafts were to be fitted with more sophisticated systems, including APQ-159 improved radar , four underwing launchers for the, 1'000 purchased in 1976, AGM-65A Maverick/laser guided bomb capability (also seen as an anti-ship weapon), APX-101 IFF, ARN-108 ILS/CPO-80 (MOD) Flight Director Computer, ALR-46(V)-2 Radar Warning Receiver, ALE-40 Chaff/Flares, Northrop AVQ-27 manual laser target designator, provision for the ALQ-101/119 ECM pod, Jest Assisted Take-Off (JATO) provision, developments of some was financed by Saudi Arabia. Two simulators were also included in the programm as well as ten interchangeable reconnaissance noses kits for the single-seaters. Tests for the new equipment was done on USAF F-5Es from January 1975, initially without fully defined improvements, delivery of the first aircraft was foreseen for June 1976, but waiting for full improvements, changed to September 1976; production of the first 2 Northrop F-5E was completed in September 1976. These aircrafts, together with 2 Northrop F-5F (completed in December 1976 and January 1977), were utilised for testings at Edwads AFB by Tactical Air Command pilots, completed by December 1977, though at least one Northrop F-5F remained in the USA for additional tests. Further production aircrafts were completed only with limited new systems, the rest was to be installed in Saudi Arabia. Northrop F-5F 50713 at Edwards AFB with red tail fin for tests in June 1981. Part or Peace Hawk IV was the retrofit the earlier, remaing 29 Northrop F-5E with the same systems as the new production ones, 18 Northrop F-5B with new radios and TACAN. The choice was between partial retrofit in Saudi Arabia or full retrofit either in Saudi Arabia or by Northrop at Palmdale, being transferred by Lockheed C-5 to/from USA. This last option was chosen, modification began in July 1977 and was completed by December 1978. This was a government-to-government contract to provide follow-on support for all 109 Northrop F-5s; it was agreed on 16-02-76 and was signed on 22-02-76, valued at USD 1'574 millions, covering the upgrading of the Saudi Air Bases system, including operating depot supply activity at Dhahran and building of three new ones during a period between 13 February 1976 until 15 June 1979. These bases were built to support the F-5s, but, equipped with the latest test equipment, the facilities would support also McDonnel F-15 at a later stage. Involved the sale and delivery of four Northrop F-5Fs and 5 F-5E to replace lost ones, similar to Peace Hawk IV aircrafts; it was initiated on 30 January 1977 at a cost of approximately USD 23,3 millions, delivery foreseen by Lockheed C-5A in the second quarter of 1978. The last 2 two-seaters were at McClellan AFB in April 1978 on delivery. The end of Peace Hawk programms came in 1986, when it was phased. 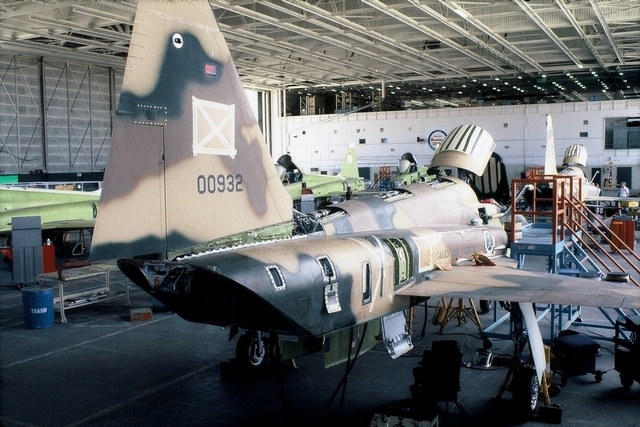 The acquisition in March 1982 of 10 Northrop RF-5E needed for a dedicated reconnaissance capability, supplementing the camera nose equipped Northrop F-5E, was not part of the programm. The Northrop F-5Bs and first 30 F-5E were in-flight delivered to Saudi Arabia in February 1974 via the North Atlantic, further deliveries on board of Lockheed C-5A. The first class of F-5 piltos was graduated in summer 1973, when 16 Saudi-piloted Northrop F-5B participated to a flypast at Dhahran AB. Another flypast, by 16 Northrop F-5s of the Operational Conversion Unit,, took place in front of King Faisal on 03-12-74 at Dhahran AFB , together with 16 E.E. Lightnings. Preliminary operational status was reached by the first two combat Squadrons by late 1975. By 1977 there were 35 Tigers based at Dhahran (together with 20 Lightnings) and 35 at Khamis Mushait. Northrop F-5E replaced the BAC Lightning F. 53 in the attack and reconnaisance role, and by 1978 they were RSAF's chief multirole fighter, including for the protection of sea lanes. The BAC Lightning was formally retired from Saudi service at the end of 1985. The first three Northrop RF-5E transited Prestwick airport (United Kingdom) on delivery on 13-01-85, the last on 22-03-85. At least four, most unusually, wore a very dark black colour the others a normal desert camouflage. In the mid-1990s, the Kingdom began entering into agreements directly with the third-party service providers to obtain maintenance and support for the F-5 fleet. This was earlier done via USAF organisations. 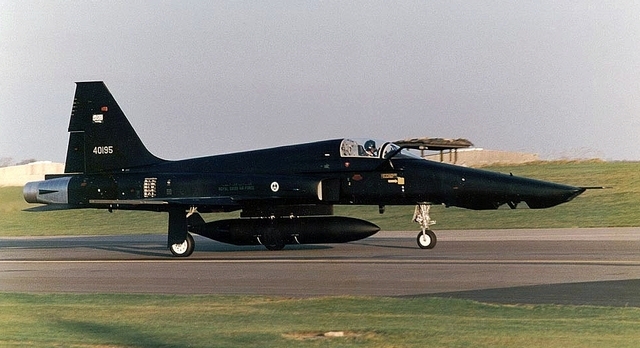 On 10-03-94 an agreement was signed with Lear Siegler to provide technically qualified contractor manning to augment, assist, train and advise RSAF personnel in overhaul/repair of aircrafts, ground equipment and navigation aids for F-5 operation; on 16-03-95 for support services; on 10-10-95 for spares; on 15-04-96 again for support services; on 20-06-97 for technical data and assistance. Under these contracts, F-5 parts and components that needed repair were shipped from Saudi Arabia to Lear in San Antonio. Additonally Lear sent peronnel to Saudi Arabia. These integrated with RSAF personnel providing training and support in post-ejection survival, photo reconnaissance, flight operations and in fighter weapons and tactics. From 1994, poor leadership of the Air Force, the mishandling of overall training, underfunding and mismanaged Saudition, brought the Air Force to the point of near-crisis. Lack of readiness, poor aircrew and maintenance to aircraft ratios (heavily depending on foreign labour and knowledge) forced the near-grounding of the Northrop F-5s. Total in-country operation and maintenance was secured by a local company, All Mozoon Group (in partnership with Lear Siegler), with the acquisition of all new and rebuilt parts. Remaining nine Northrop RF-5E were upgraded with the installation of Global Positioning System navigation in a $7.4m deal with Northrop Grumman in 1997. Twenty-seven RF-5E mission-planning systems were purchased from Lockheed-Sanders Corporation (now BAE Systems) in 1995; structure was strengthened to prolongue operational life. The earlier mentioned contracts with Lear Siegler expired in 1999; aircrafts parts still in storage at San Antonio and Saudi Arabian taxes claims leaded to an US court dispute, only partially solved 10 years later. Requests for authorisation for purchase of spares for Northrop F-5 and RF-5 were placed with the US Governement till at least October 2005, but number of Squadrons operating Tigers were constantly reduced (see Units/operation page). Lack of finance and necessity to improve readiness, training, and capability for joint operations were factors that delayed the selection/purchase of a Tiger replacement till 2007, when on September 11th a contract was signed with the United Kingdom governement for the acquisition of 72 Eurofighter Typhoon, first two being delivered to Taif AB on 24-06-09. There is no news of Northrop F-5 intervention against Houthi rebels at the Saudi/Yemeni border during November 2009-January 2010; confirmed are only McDonnel F-15s and BAE Tornado operations. About a dozen Tugers were reactivated only for a short time in 2010. According to unofficial sources an offer for sale of 55 Northrop F-5E/F was issued on 17-08-09, additional to follow later; two simulators for each 15 aircrafts purchased were available as well as a free training programm for 4 aircrews and 4 groundcrews per 15 aircrafts purchased. No price was given, just the highest bid; no aircraft could be sold. Another tentative to sell 79 Tigers was started via an US broker in December 2014, opening date of envelopes offers being the 20th February 2015. The 78 aircrafts. Northrop F-5E, F-5F and RF-5E, are stored at Taif - Al Fahd AB along an auxiliary runway. Fortyeight of the strored Northrop F-5 have been offered to Tunisia in the context of security co-operation between the two countries. No exact information is available regarding various training losses. Reported losses till 1976 were: two Northrop F-5B and 1 Northrop F-5E; by 2000 approximately 20 of all types.